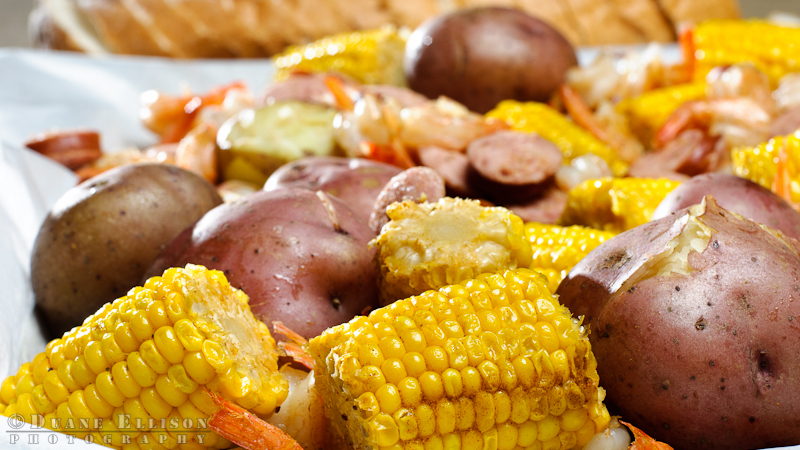 I did a bit of food photography today to capture the results of a shrimp, sausage, potato and corn boil. It is a very colorful (and tasty) meal. We pulled all the ingredients together and staged the shoot to include even fresh bread in the background. It was really fun to shoot (and eat) and the images came out exactly what I was looking for. The lighting configuration was fairly simple and straight forward. I had a medium Photoflex Softbox overhead and a grid spot shooting across the screen from the top right of the frame. Both modifiers were powered with Alien Bees AB800. I put the Nikon 50 1.4 AF-D lens on my Nikon D300s and shot the scene at F/9 for a bit more depth of field.